SAP Africa in collaboration with SAP Next-Gen held an event on the 8th March 2017 to launch the Africa Chapter of the Women in Data Science (WiDS) Initiative. Coinciding with International Women’s day, the event was held at the Hyatt Regency, Rosebank with the theme: African Women, Unleash Your Inner Data Diva! The aim of the Women in Data Science Movement is to inspire more women to pursue and excel in Tech-related careers, with a focus on Data Science as an emerging field where there is already a need for specialised skills. SAP Africa also announced a commitment to sponsor bursaries for 5 women to study Data Science, making a direct contribution towards promoting women ICT skills to drive next generation of data scientists. 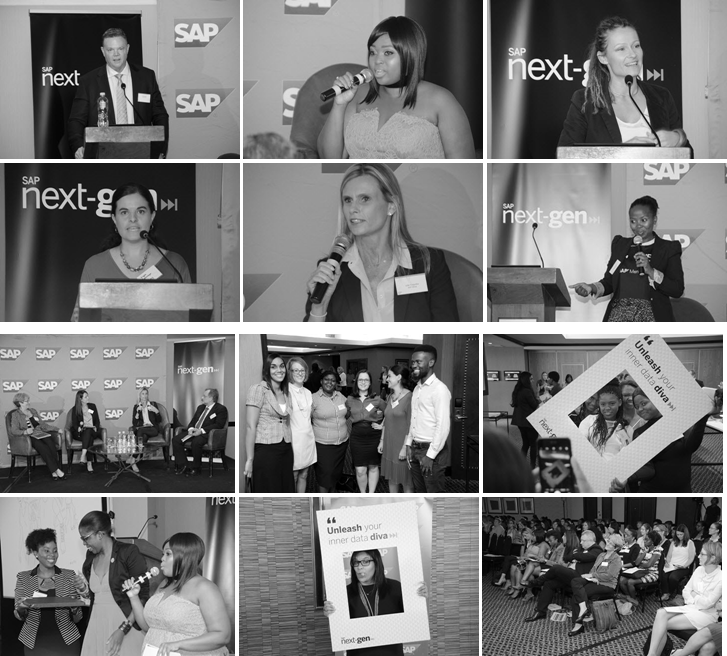 In attendance were over 110 female learners, students, professionals and executives within SAP’s Ecosystem. This provided a rich networking opportunity where young women could learn from and engage with women already in the field. The event MC, 702 radio host, Relebogile Mabotja, provided a vibrant energy throughout the day. Brett Parker, SAP Africa MD and Executive Sponsor for WiDS, opened up the event highlighting the importance of diversity in Tech as a driver of innovation. The program featured prominent female leaders in ICT, specifically in Data Science, who are driving the digital transformation agendas and big data projects within their organisations. This included Dr. Adriana Marais, SAP Africa Head of Innovation and Mars One Candidate, who spoke about SAP’s Innovation story as well as her motivations for wanting to be amongst the first humans to settle on Mars with Spacex. She was then joined by Carla Sharpe, Square Kilometre Array (SKA) Business Manager, who shared the importance of Data Scientists in projects such as SKA. Zimkhita Buwa, Britehouse, Regional Manager Western Cape, inspired with her personal journey as a young female leader in a male-dominated field. Angela Rademeyer – Discovery Health, Divisional Manager Health Actuarial and Helena Van Staden – Discovery Limited Divisional Manager & Statistician discussed paths to becoming a Data Scientist and what skills and competencies are necessary to build a Data Science team. They then shared a case study of how Data Science is central to the Discovery Vitality program, a key aspect of their business model. We convened a panel of WiDS advocates, moderated by Tracy Bolton, SAP Africa, Director General Business and Partner Operations. The panel included a multi-disciplinary perspective on the topic from Prof Aurona Gerber, University of Pretoria IS, Julie Tregurtha, SAP Africa Director Database, Technology and Mobility and Mark Walker –IDC, Regional Director Africa. Lastly, representing SAP Next-Gen, Kwena Mabotja provided closing remarks and issued a call to action for our SAP ecosystem to join us in this effort. The event was positively received by the audience, who felt inspired and learned more about Data Science, some of whom have already expressed an interest to take an active role in WiDS going forward. It also gave an opportunity for SAP people to engage with customers/partners on a pertinent topic and strengthen relationships beyond the ‘day-to-day’ activities. We were trending on twitter, generating 200 000 impressions, 350 000 accounts reached and 1,3M Timeline deliveries. There are also several mentions in the media including interviews on the SABC Channel and publications such as IT Web. Following this launch, the SAP Next-Gen team will hold follow-up meetings with potential collaborators. We will also have an event quarterly and regular blog posts, to ramp-up awareness. We are planning a follow-up event at the University of Pretoria on the 18th May 2017. A big thank you to Brett as Executive Sponsor, our speakers, participants, SAP Africa and SAP Next-Gen colleagues as well as collaborators from the Stanford WiDS organisation who have supported with shaping the agenda, inviting our valued SAP customers and partners as well as with marketing/event logistics and communications. The success of this event would not have been possible without your inputs. WiDS is an initiative spearheaded by Stanford University, with many partners worldwide, focusing on inspiring women to enter the field of Data Science. The Women in Data Science (WiDS) Movement aims to inspire and educate data scientists, regardless of gender, and support women in the field. WiDS aims to provide opportunities to hear about the latest data science related research in a number of domains, learn how leading-edge companies are leveraging data science for success, and connect with potential mentors, collaborators, and others in the field. SAP is supporting the WiDS Movement globally in 50+ locations in collaboration with Stanford’s Institute for Computational & Mathematical Engineering (ICME).